Populus Nigra. There are two kinds of Poplars, viz. Black and White. The White Poplar grows large and high, covered with thick, smooth, white bark, especially the branches, having long leaves cut into divisions almost like a vine leaf; they are a glossy shining green. The cat�kins which come before the leaves, are long and of a reddish colour; which fall away, seldom bearing good seed with them. 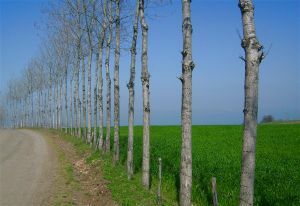 The Black Poplar grows higher and straighter than the White, with a greyish bark, bearing broad green leaves, some�what like ivy leaves, not indented on the edges like the White, ending in a point, and not white underneath, hanging by slender long foot-stalks, which continually shake like the aspen leaves. The catkins hereof are greater than those of the White, composed of many round green berries, in a long cluster, containing much downy matter, which being ripe is blown away with the wind. The clammy buds before they spread into leaves, are gathered to make Unguenum Populneum, and are of a yellowish green colour, and small, rather sweet, but strong. On both these trees grows a sweet kind of musk. which formerly was used to put into sweat ointments. White Poplar, says Galen, is of a cleansing property : one ounce in powder of the bark being drank, says Dioscorides, is a remedy for those that are troubled with the sciatica, or the strangury. The juice of the leaves dropped warm into the ears, eases pains in them. The young clammy buds, or eyes before they break out into leaves, bruised and a little honey put to them, is a good medicine for a dull sight. The Black Poplar is held to be more cooling than the White, and therefore the leaves bruised with vinegar, and applied relieve the gout. The seed drank in vinegar is held good against falling sickness. The water that drops from the hollow places of this tree, takes away warts, wheals, and other like breakings out of the body. The young Black Poplar buds, says Matthiolus, are much used by women to beautify their hair, bruising them with fresh butter, straining them after they have been kept for some time in the sun. The ointment called Populneum, which is made of this Poplar, is good for all inflammations in any part of the body, and tempers the heat of wounds. It is much used to dry up the milk of women's breasts, when they have weaned their child.